The official statistics on loneliness are collected biannually by Stats NZ. 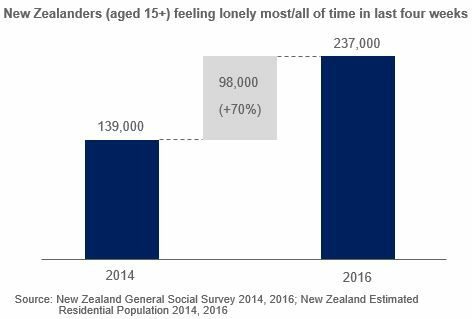 When we compare the 2014 and 2016 loneliness statistics, there is a dramatic increase in New Zealanders aged 15+ feeling lonely most/all of the time. Compared to 2014, there were an additional 98,000 New Zealanders feeling lonely most/all of the time in 2016. This corresponds to a staggering 70% increase in two years, which equates to a 30.3% cumulative annual growth rate (CAGR). At first blush this increase looks like a change to the survey questionnaire, however the same question was asked in both the 2014 and 2016 surveys. Download the 2016 source data. Download the 2014 source data.